Get first aid certified. At the American Red Cross, our mission is to help people prepare for and respond to emergencies properly. In order to accomplish this goal, we have developed a wide range of training opportunities and certification programs that can empower you to help during times of crisis. 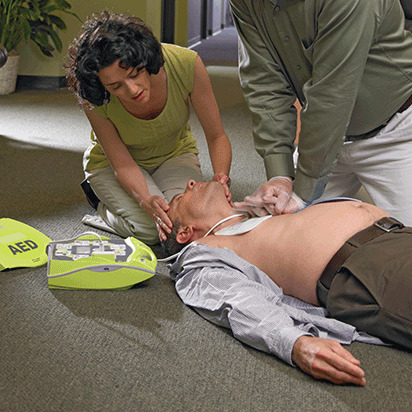 Designed, and taught by experts, Red Cross first aid certification courses are OSHA compliant, and affordable. Best of all, with the ability to take classes in-person or through our best-in-class blended Simulation Learning, which combines an online component with in-class skills sessions, you can earn your first aid certification in the way that suits you best. Along with our first aid certification program, we also offer recertification courses for current certificate holders, as well as continuing education credits for first responders, nurses, teachers, social workers and others. Our teams are currently approved to award CEUs in Preparedness and Health and Safety Services courses, including CPR/First Aid/AED, wilderness and remote first aid, CNA training, swimming and water safety, lifeguarding, and more. To find the continuing education courses you need, browse our list of eligible CEU training opportunities. When you learn how to perform first aid and get certified from the American Red Cross, you'll get anytime, anywhere access to your certificates; plus the ability to print, share, and download them wherever and whenever you like. 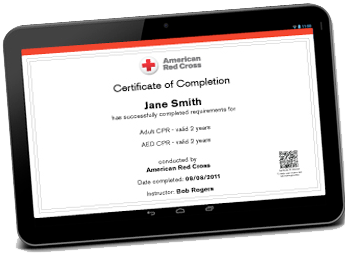 Digital certificates can be viewed, printed or shared online and can be accessed anytime through your Red Cross Account. Each certificate includes a unique ID and a QR code which meets employment requirements and allows employers to easily confirm your certificate is valid. Class participants and employers can visit redcross.org/confirm and enter the ID found on the digital certificate (or scan the QR code with a standard QR reader using a smart device) to access a copy of the valid certificate with student training information. Click here for instructions on accessing your Red Cross certification.